I have none of "memory lane" as the only time I've run it in a vehicle was in about 1976 in a 1974(maybe 1975) Jeep Cherokee. At the time I was four years old but remembered it well(surprisingly, no pun intended) when I finally went back there a couple years ago and found the surroundings very familiar. Here's a few pics of what Surprise Canyon looks like currently. I've been back a few times in the last couple years, love observing the spectacle of erosion. Panamint Valley and the surrounding area is one of my favorite destinations for pure back country adventure. Location: Tin Benderland-- Ridgecrest, Ca. i've got a question that in the twenty years or so-- has not found an answer----- where does the water that comes down the stream come from ???????? don't say the spring--- i know that---- BUT--- think about it---- water does not run uphill----- and the spring is near the top of the Panamint range-- @ 6,000+ '--- there are NO taller hills around !!! there is NOT a snow pack----- the only hills with snow or glaciers is about 100 miles away !!! just south of Mammouth !----------- so where does the thousands upon thousands of gallons of cool/clear water come from ??????? 24/7/365 !!!!!!!!!!!!!!!!! older than dirt/before rocks were invented! I was around when Pearl Harbor was bombed ! the next is in the canyon on the way down-- WITH CAMO !!! the next shot is the Panamint range, shot from the PVD (Panamint Valley Days) encampment-- the entrance to Surprize is above the forth rig from the right--- and runs to JUST ABOUT THE TOP OF THE MTS. !!!!!!! Death Valley is the other side of the mts. ! Last edited by Krusty; 05-31-2007 at 08:36 AM. in the SEVERAL trips in the canyon, we NEVER had a spill of any 'chemicals' -oil-fuel-or the like ! !--- and as odd as it might seem, never had a rig roll to where it was disabled !!! The canyon is impossible to photo in !!!! once your in the canyon, everything is UP or DOWN and your prospective thru a lens can not due justice to the up-ness or down-er !!!!! as i look back at most of the pics i have--- they mostly seem to be the 'down' leg !!!! maybe cause you are too busy on the way up to get pics !!! he wanted a strap down 'fall 7' (at the top of the hard part ) (there were 7 'water falls' to go up/down), on the start of the homeward leg--- "get me outta here !!!" note-- Lisa and the kids walked !!! Last edited by Krusty; 05-31-2007 at 04:31 PM. Sure glad I had a chance to drive that once. What a trip! I'll never forget it! where's the next one ??? bottom of #1 looking up, STANDING in the 'landing pad'-- -- "BRING IT !!!" Rob lineing up #1 --- AND CAMO CHECKIN HIS PANTS AFTER HIS DECENT !!!! Last edited by Krusty; 06-03-2007 at 05:28 PM. Mobil1--- looks a lot like Marlin------ he used the canyon for R&D as he was developing the stuff we take for granted now, as well the pleasure of the trip!!!!!!! that nose stand is the FAMED FALL#1 !! Last edited by Krusty; 06-03-2007 at 05:02 PM. I kinda featured Camo cause a lot of folks know him, and he IS a Tin Bender ! in those days, you couldn't pick up a 4X mag that didn't have pics/articals about the 'Big Two"-- the Rubicon and Surprize Canyon. I kinda wish we could have those days back again !!!!! and as a kinda side note;;; there was NO TRASH !!! (not 1 can/bottle/candy wrapper--- ) and we didn't carry bottled water--- no need to !!! there was a cool stream there !!!! drink to your full ! 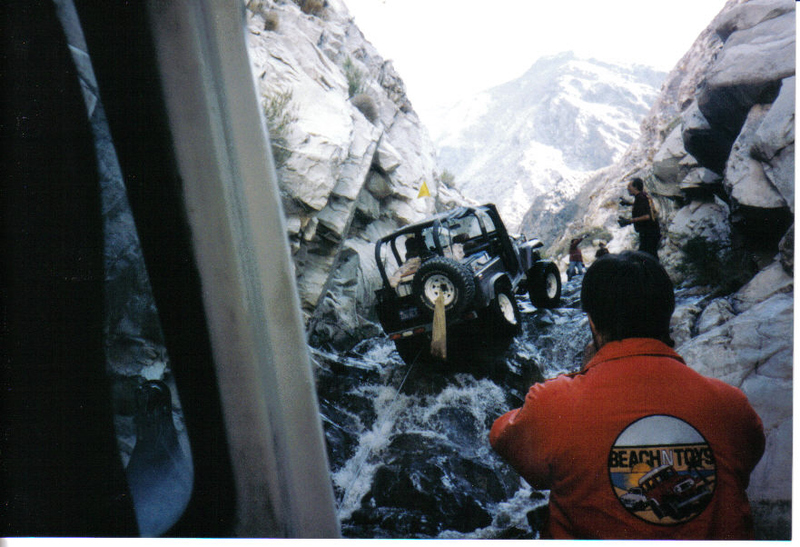 those were the days when people cared about their trails and condition/beauty of those trails !!! NO ONE would think of throwing trash out !!!!!! It just wasn't done ! Last edited by Krusty; 06-01-2007 at 03:48 PM. Have I seen a pic of you and Slim on the front porch ? yeah KRIS........that be me in about 1968-69? sittin with seldom seen slim (charles ferge). he was very ill and he stayed in one of the cabins for a few weeks before he was taken to the hospital and eventually passed away. Location: Calif. The land with no electric. Great thread. I sure miss this place. Here's a few pics & a link to more. 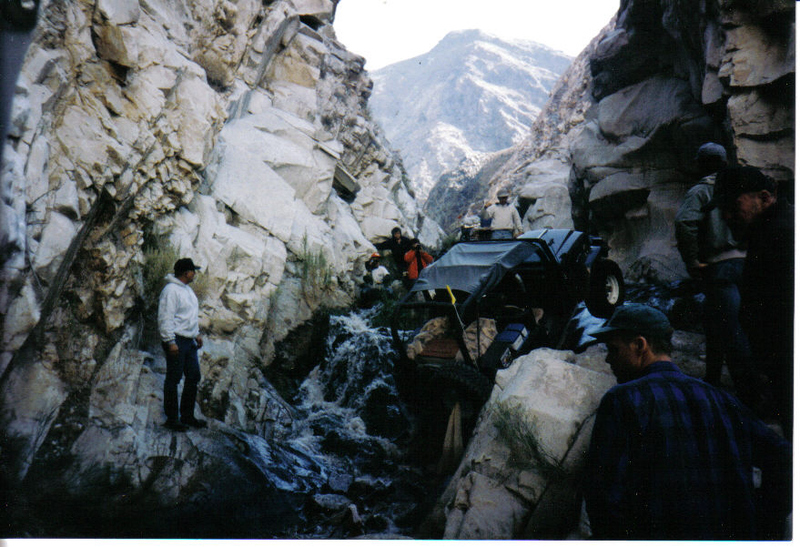 Pics are from Panamint Valley days 6th annual Suprise Canyon Expedition,Nov.1995. Last edited by Live Wire; 06-03-2007 at 01:53 PM. What a great thred! great pictures, and cool stories. I would love to run this trail some day. If it ever gets re-opened. Location: Building Trick cars, pretty close to heaven. This is a great thread, cool to see what I have not yet experienced. Soon though Right! Wow, those trails look amazing. Talk about a place forgotten, it's very beautiful. Anyone reamber "Happy Cyn"? It was on the right of Surpise Cyn. Went up there w the Nov event, 89. The next year they closed Happy Cyn. So i went up Surprise Cyn. 4Wheeler Mag went with the 12 of us. I did the run with a hardtop on, they took my photo. Only pushed in the rear window on the top. Did "Panamint valley days" from 89-93.